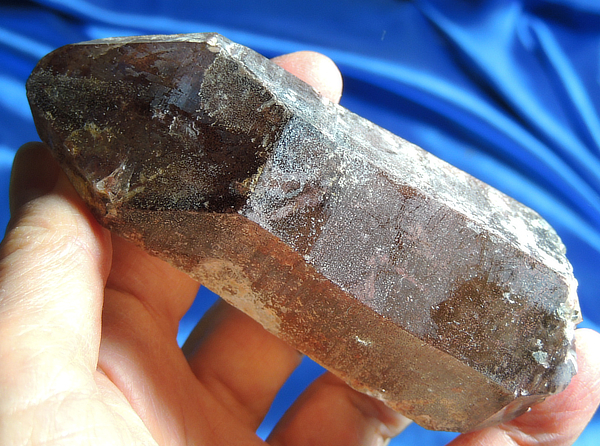 This is a rugged-looking and nearly opaque DT Lemurian seed quartz from weighing 6.7 oz and 3.8” by 1.5” by 1.35”. She is a new arrival but from old stock that was dug over 30 years ago. She is a rich, red color from hematite staining with a dominant, stepped, eight-sided abundance face on the upper termination. Her lower termination is a multi and looks like a series of rugged mountain peaks with her calcite deposits resembling snow. When held to a strong light, you can see that her inner crystal is very clear and there are loads of tiny hematite spheroids on her. Rugged or no, she is a bright and beautiful Spirit meant for a special Keeper. Red is the color of the Root Chakra, where you draw your primal Spirit. It is the essence of tribe, of family and of community. This is a wondrous Spirit who has defended all that she has held dear and shows the effects of her encounters. She teaches us that this is a powerful energy from which to draw and can sustain us when we are at Life’s lowest points. We can successfully turn fear into courage, anger into determination and defeat into victory – if and only if we harness the energy of the Root Chakra. Meditate with this Spirit and allow her to show you that strength. As you breathe, draw those energies and that strength into your Root Chakra. Slowly, pull it into each Chakra in turn until you can feel a flow streaming through the Crown. Allow the flow to continue from toe to head – there will be a total warmth, complemented by a calm knowing, an inner strength – you have accessed your Soul Source. Remain like this until you feel complete, thank the Spirit and incorporate the lesson, returning frequently to savor the Source. Click on the link below to see additional pictures. ©2019 Topaz Spirits. All rights reserved.